At FIS’s banking conference in Orlando last month, the talk was of digital disruption. As if Dodd-Frank financial regulations and blockchain technology weren’t enough to contend with, here comes the “two guys from Ireland” to eat their lunch. Brothers Patrick and John Collison grew up in a remote part of Ireland and didn’t have internet access until they were teens. But they created Stripe, which is being heralded as “a far simpler method of processing payments” that could wipe out banks’ credit card processing business. Stripe was recently valued at $5 billion, and the brothers have relocated to Silicon Valley. 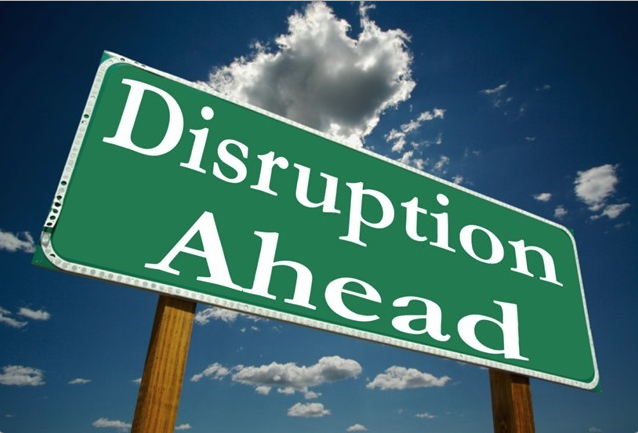 Understand the nature of disruption in your market. To understand the nature and pace of disruption, look at the exponential rate of technological advancement. When the term “disruption” first entered the business lexicon in the late 90s, the phenomenon was confined to the disk drive industry and a few others. Today, it’s an ever-growing threat to virtually every industry. Banks and bookstores and brick and mortar retailers of all stripes are endangered. Already in 2016, the shift to online shopping has decimated big box retailer Sports Authority and regional chains across America. The college textbook industry has essentially stopped acquiring new titles, and laid off thousands of editorial employees. Moore’s Law predicted a doubling in storage and processing capacity every two years, and that’s what’s occurred. Combine Moore’s Law with the enabling power of The Cloud, and the entrepreneurial zeal of Collison brothers around the world looking to make their mark, and you get a glimpse of what is to come over the next three to five years. And what you must do to prepare. Understand what’s really going on with your value proposition. In my work across industries, I regularly see numerous forces and factors triggering dislocation, not just technological. Among them: lifestyle changes, demographic shifts, and new regulations, to name only a few. Scientific breakthroughs can be triggers. Dentists are having a hard time because better preventive measures (fluoride, for example) means people are getting fewer cavities so there’s less drilling and filling to do. Consumers are drinking 36 percent less fluid milk, as an array of alternative beverages such as almond and soy milk, become available. More and more Americans are opting for cremation, disrupting the traditional funeral industry in the process. People are writing fewer and fewer letters, and the envelope industry is idled. Who will need auto insurance when driverless cars arrive? The age of disruption demands that we develop a closer understanding of what’s producing value for our customers, and how today’s value proposition might be obsoleted by new offerings that give customers greater choices. In the age of disruption, being in denial is not an option. Kodak had 16 years to fend off digital disruption before declaring bankruptcy in 2012. After the iPhone was introduced in 2007, Blackberry saw its market share plummet from 53 percent to three percent in only five years. Clearly the time to respond is diminishing, and delay can be costly. With disruptive forces afoot, the natural tendency is to downplay their significance, or to make incremental moves to regain position. As a leader, it’s vitally important to not get caught focusing on the wrong things. Gather data, talk to outsiders and pick their brains for insights and advice. Study history, and develop a point of view about where things will be three to five years from now under various scenarios. Regardless of your industry or your title, you can make yourself indispensable to your organization by chasing the storm, rather than hiding in your bunker. Having studied the downfall of once-powerful companies like Kodak, Blockbuster, Radio Shack, Blackberry and others, my conclusion is that we have less time than we think to take action. Assault industry assumptions. Every industry makes assumptions about things like “how we operate” and “what customers want.” These assumptions are unchallenged, and become canonical. A disruptor comes along and sees the buyer-seller relationship afresh, and doesn’t harbor the same assumptions. And while these attackers toss conventional wisdom aside, industry incumbents can fight back if they wake up in time, and do some unfettered thinking. Questions like these can be good for getting started: If we were going to go after our business model, where would we start? If we unbundled our value proposition, what would that look like? What business are we really in? What aggravates our customers such that, if we could eliminate it, would create a stronger bond with our customers? What are some core assumptions about how our industry creates value that may no longer be valid? Experiment constantly. Test and try out new business models, new products and services and marketing methods and see what appeals to post-disruption consumers. Consider various scenarios and allow nothing to be sacred and untouchable. Look to other industries for business models to borrow and adapt to yours. A global hotel-booking company used speeded up feedback cycles on multiple offers to gauge consumer reaction. Software maker Adobe recalled the old saying “if you can’t fight them, join them” and no longer licenses versions of its software in one-off transactions; today it provides software as a service. The ski industry’s star innovators, such as Killington Resort in Vermont, realized that aging, affluent Boomers weren’t going to engage in the sport nearly as much as before so they beefed up their conference business instead. Whistler Resort in British Columbia rethought the idle summer months of no snow and created a series of summer festivals and competitions that fill beds at its resort. Instead of trying to play catch-up to disruptive competitors, ask what you might do to add value and truly delight customers by adding new, unique or exceptional value. People glommed on to Uber because the typical cab experience (provided you could find one) was less than desirable. They shifted to digital photography because the old way was so expensive and cumbersome. The age of disruption demands that we develop a better understanding of what’s producing value for our customers, and what’s not. Yet the established players in any industry are not sitting ducks. They can disrupt the disruptors with enough moxie, creativity and willpower.